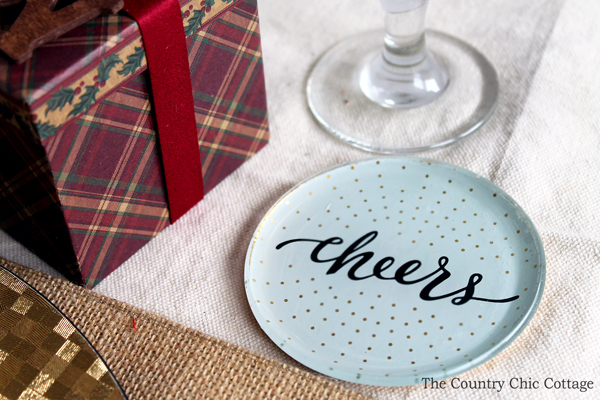 I created a rustic Christmas place setting with items from a new to me store that y’all are going to love. 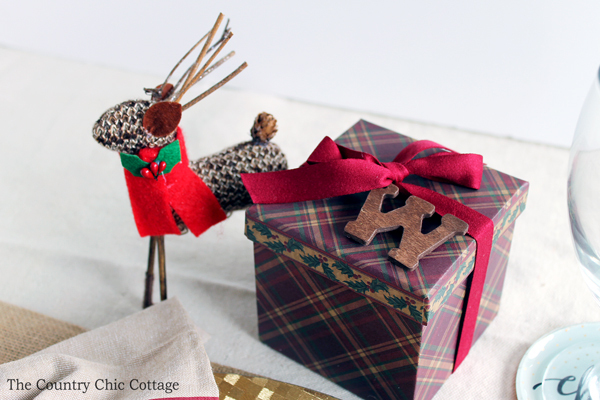 I am excited to partner with At Home for a Christmas decor series this year. I am starting with this place setting but there will be more At Home Christmas Decor to come so y’all stay tuned. 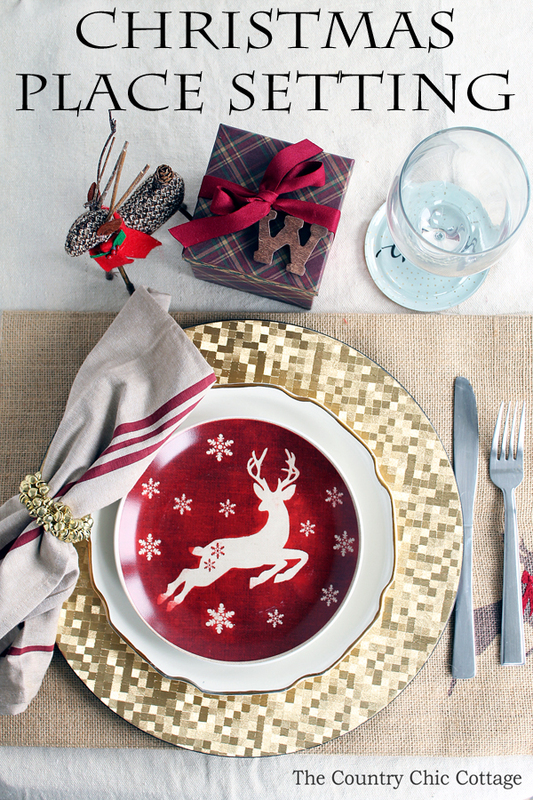 Are you ready to see the items I picked up and get inspired for your own Christmas dinner party? If you have never heard of At Home, be sure to read on about the wide selection and everyday low prices you can find there. Almost everything you see in the pictures is from At Home. The white plate pictured below is from my china but otherwise you can grab everything you need at an At Home store near you. 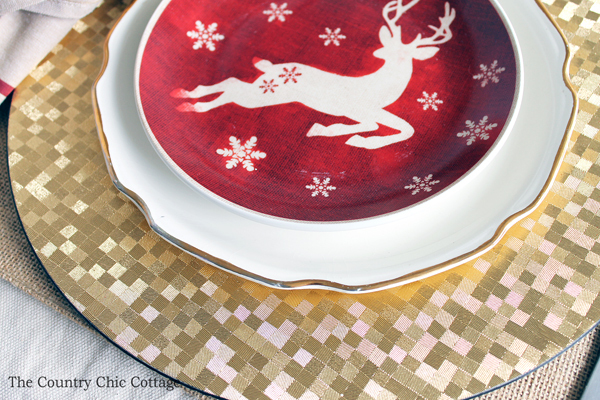 Those gorgeous gold plate chargers are what started my thoughts flowing on this Christmas place setting. 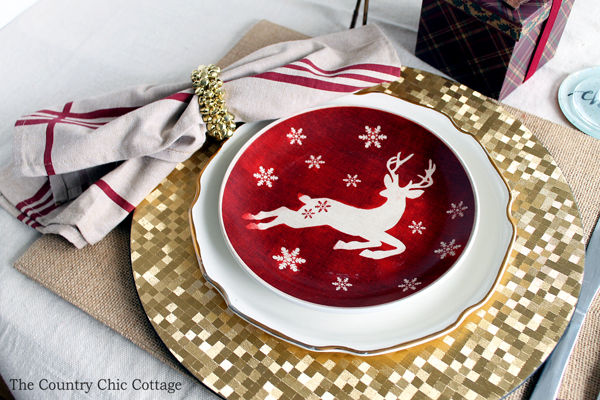 I then found those too perfect deer dessert plates and knew exactly how this rustic table was going to be set. 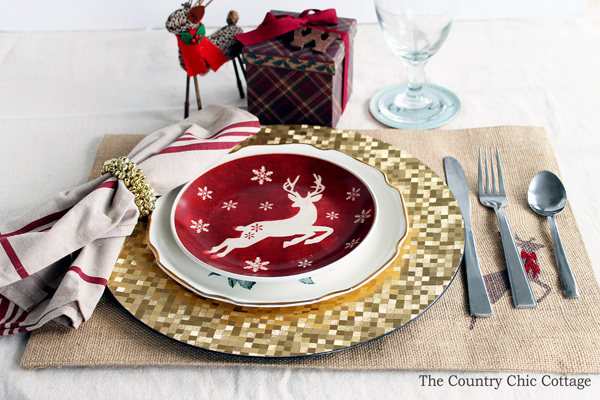 The burlap place mats with the deer in the corner were a perfect addition. I love all things burlap and was happy to see tons of rustic decor like this as well as elegant decor when I shopped At Home. Most of the Christmas decor is divided up into decorative themes so it makes it easy to find and shop your style. Of course mixing and matching is encouraged! I personally loved the Holiday Hoedown collection. 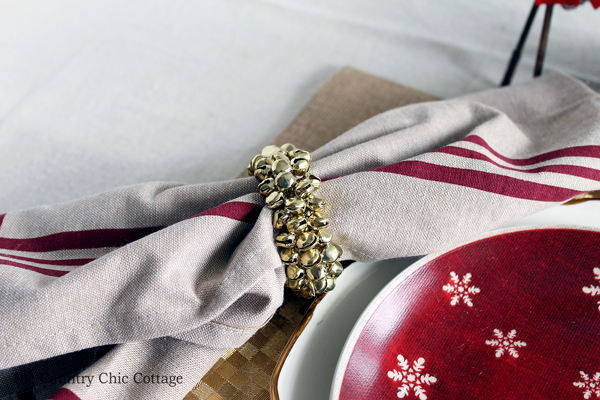 The jingle bell napkin rings come in a set of four and are the perfect addition to any holiday table. I also found the napkin I used in the At Home Christmas section. It is actually a tea towel but worked perfectly in this scenario as a napkin. The wine glass and coasters were found throughout the At Home store. I love mixing items that are not just for Christmas. These coasters can be used all year! I cut the hanger off of a small deer ornament to decorate the Christmas place setting. I also grabbed a box from At Home to add in a fun favor for the meal. Wrap it with a bow and finish it off with a wood letter for a fun place marker. Everyone will know where to sit at dinner plus they get to go home with a small party favor. At Home is the one-stop-shop for customers to design their whole house – every single room. They have a huge selection of Christmas decor but also rugs, furniture, and so much more! This was my first trip and I was really excited about the selection. I know I will be back! At Home also offers 101 Varieties of Christmas Trees. The At Home tree lot covers an acre of fun with over 100 trees. At Home has a large in-store tree selection to touch and feel. Each tree is curated because of a unique feature and every tree in the store (with the exception of 1) is exclusive to At Home! They just might have the Tree for Me. Have you ever shopped an At Home store? If not, what are you waiting for? Trust me you will want to find a location near you. 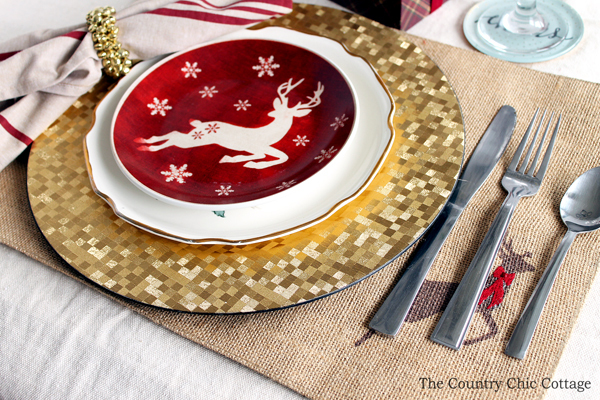 After all, this Christmas place setting can be complete with just one trip! Love things I’m seeing from “at home” store. Look like very nice items. Love burlap place mats with deer on them and everything else I saw. 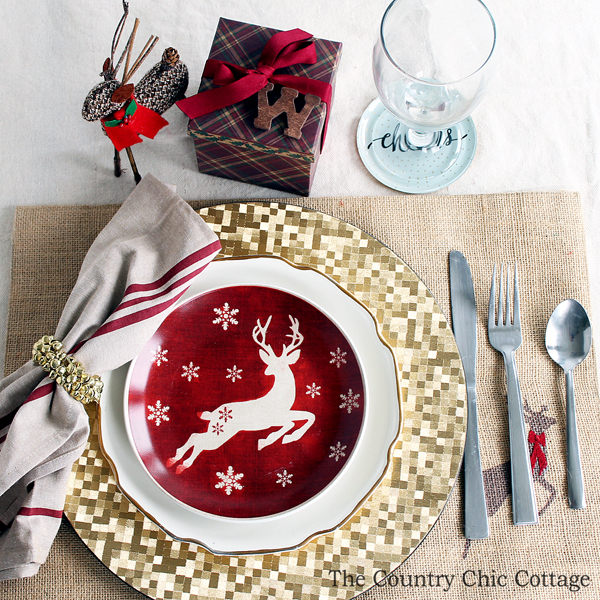 If you bought those place mats your table will be very festive, love little deer with stick legs. I might be only person without holiday dinner ware. Found some pretty holiday plates etc. at Good will today but didn’t buy any, was really tempted. Now wish I had. They were reasonably priced for once.Goodwill gets carried away with their prices. Did buy couple little holiday things for decorating. Don’t work too hard, enjoy the seasons. I love the look of this place setting and how rustic it is. 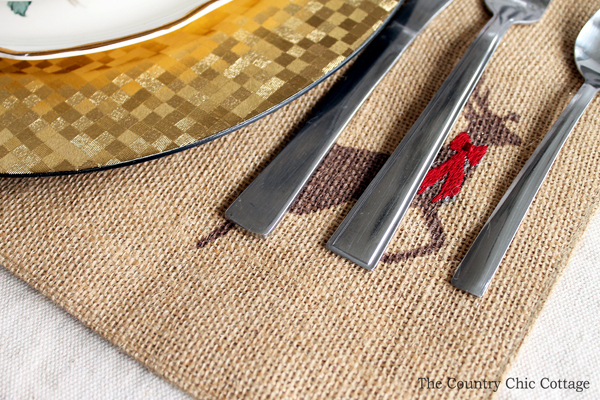 I love the little deer statue and the burlap place mat is so adorable! Love your table setting! I just moved across country, so I will have to check for the At Home locations. Thanks for sharing! I love this place setting. Those burlap placemats are so cute! I need to track them down at home this week! Thanks for linking up with the Creative Exchange. Love the table settings. Pinned & shared. Thanks for joining the Inspiration Spotlight party.